It’s no secret that my passion is music. My trusty 1st Gen iPod touch with the scratched up screen goes everywhere that my wallet and cell phone go, though I haven’t decided on a nickname for it after all these years. I might as well just call it “essential.” Sure, I may seem antisocial every time I stroll around campus with my headphones in on the way to class, but you can’t blame me for finding great new albums on Purevolume and iTunes that I eagerly wait to listen to during my travels. My love for music doesn’t stop there, though. Why not do my part to add character and grand memories to the music industry? I have always felt like the world needed to hear the tone of my angelic voice, no matter how much (or little) talent I have. A little bit of Bill Karalius is enough to shake up the wide world of music, but I needed a place to start my journey. Everyone knows that the best way to share the gift of vocals is at the local karaoke joint. There’s something alluring about a cheesy, smoke filled bar and restaurant with the outdoor porch designated for singers and drunks to project their sweet voices through a PA system that has occupied the same space since the early 90’s. Sometimes singing alone just isn’t enough to wow the audience, and luckily I met someone who shared the same views on the karaoke scene as I had. His name is one that you probably know from some SyFy channel show called Ghost Hunters International, Scott Tepperman. Scott has been destroying the unsuspecting ears of bar patrons all around Tallahassee for the past few years, and has quite the stage presence. I was but a newbie at this strange ritual of singing words that show up on a Radio Shack TV monitor at the time I joined Scott for karaoke at the 1st annual ALPHA Ghost Team karaoke party. During my nervous rendition of Men at Work’s “Down Under,” Scott saw the potential that I had for a successful future in singing horrible music. 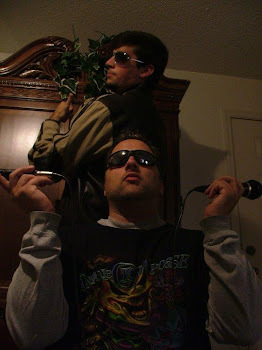 He had the idea of forming a karaoke group that would be recognizable worldwide, whether it be good or bad. I was the missing piece. Thanks to his excitement and my cooperation, Tears For Ears was born. At this point you’re probably wondering where Ron Bordner is in all of this karaoke mess. Yes, Ron is a talented singer/screamer who has done many solo performances of heavy metal songs like Slipknot’s “Duality.” However, he has told Scott and me countless times that he would prefer to sit on the sidelines to prevent any embarrassment. Embarrassment couldn’t be a better way to describe what Tears For Ears is all about. Most would say that it was smart of him to pass on the offer to join Tears For Ears… especially Ron himself. What sort of fame, fortune, and disappointment did Ron end up missing out on? Only a pair of sunglasses and a dirty ashtray full of memorable performances that will forever be stored in the minds and hearts of the witnesses present during each song. Tears For Ears in action! Each song that is gracefully covered by Tears For Ears goes through weeks of preparation before we hit the stage. It all starts with an email from Scott that ends up sitting in my inbox for roughly 2 to 3 days, due to my neglect to check my account on a daily basis. This email comes complete with youtube links to old music videos that have not been seen since MTV played music on their network. Old songs, right? Scott uses lingo in the email that indirectly lets me know the level of importance and priority for each of the attached links. These can be phrases such as “This song is badass,” “We should do this one,” and “WE MUST SING THIS NEXT TIME!” As you can imagine, there are more songs in my inbox than we are actually able to sing at karaoke night. On any given night, we go up around 3 times in 4 hours due to the high demand of people who want to sing their generic country songs that all sound the same to a city boy like me. 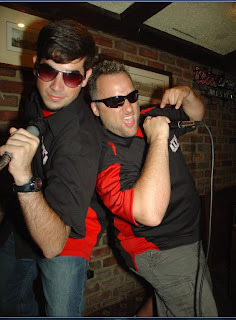 Apparently Tallahassee has a large demand for karaoke, which means Scott and I have to take full advantage of the few chances we have to rock the crowd. What happens in the weeks leading up to that Thursday night under the spotlight may surprise you. I don’t do anything. It’s true; I procrastinate like nobody’s business. This is the WRONG way to prepare, due to the fact that on average I’ve never even heard of 4 out 5 songs Scott sends me. This results in a nervous Bill Karalius playing a youtube music video over and over again while studying and surfing the web. The important part is that I am able to learn the melody in time for the trip to the bar. Even though I may learn the melody, it doesn’t necessarily mean that I can sing the melody. 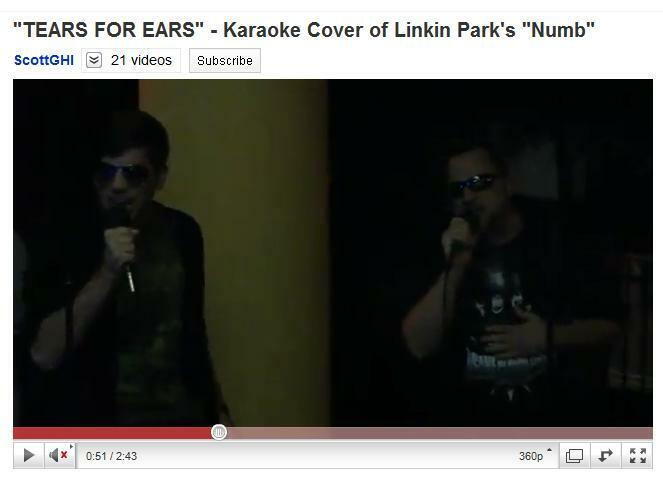 This can be a challenge for songs written by Heart and Linkin Park, and it has shown. Scott and I gave it our all in an attempt to not only sing Heart’s “Alone,” but also “Crazy on You.” We unleashed a new level of karaoke, that’s for sure. If you’ve ever wanted to hear two grown men crack their voices every few seconds, those are the videos you might want to watch. Wait… you’re probably wondering if there are videos of Tears For Ears. Of course! For your viewing pleasure, we have taken the liberty of uploading all of our good, bad, and ugly performances on youtube. I know that not everyone is fortunate enough to be there for our displays of talent, so we made sure that you can enjoy the unparalleled entertainment of Tears For Ears from the comfort of your own computer. Our impact on the karaoke community has been an immediate and long lasting one. The folks at the restaurants stop socializing and put down their food to give us their full attention, because they’re on the edge of their seats waiting for what we’re going to sing next (or maybe they just cover their ears). 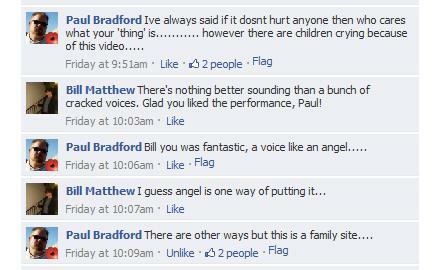 Some high profile people have had things to say about our performances, like GHI’s Paul Bradford. Okay… the things that have been said by him may not have been favorable, but we all know that deep down he loves what we do. Tears For Ears can be found on facebook, with a whopping 54 dedicated fans who live and die for our newly released videos. You too can take a listen to our artistic, entertaining performances on that page, Scott Tepperman’s fanpage, and even by clicking the “Tears For Ears vids” link on the top of my blog page. 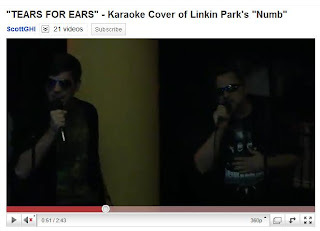 If you take the time to watch those videos, you will never look at karaoke the same again. I like that you're able to tell what level of song you get by Scott's words. I feel like I'm developing those codes with my fellow friends... though mine aren't often complete sentences.